World Safari © 2010 IGT [International Game Technologies]. 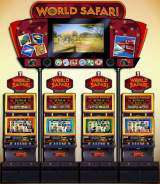 Three 3-Reel/50-payline games are availables: Coral Riches, Jungle Magic & Wild Savanna. Trademark filed in November 2007. Game released in November 2010.